With three meals a day every day, it’s pretty much a given that not every single one of them will be beautiful/glamorous/otherwise spectacular. (Unless, perhaps, you have a personal chef, in which case – why are you reading a food blog?) There is always going to be some standing at the counter eating cereal (Ben), sneaking a piece or three of cheese to keep hunger at bay until dinner (me), and ordering Mexican carry out for a floor picnic after the kids go to bed (us, exciting Friday night). Not all food is going to be exciting but then, doesn’t that just make a special meal even more impressive? This meal is a new favorite of ours. With all of the fresh ingredients and vibrant colors, it definitely stands out from the usual day-to-day fare. Funnily enough, the inspiration for this meal came after browsing the menu at a local sushi/seafood place before we ended up settling on that Mexican food floor picnic instead. I couldn’t get the idea of this out of my mind, so I decided to make my own. The dish evolved quite a bit from my initial plans based on seasonal availability but the end result was superb. This was my first time making seared tuna steaks at home and now I am kicking myself for not trying it sooner. So very easy and extremely quick! This would also be an excellent recipe for serving to guests since it is so quick to come together. To make the dressing, combine the vinegar, soy sauce, olive oil, scallion, ginger and red pepper flakes in a liquid measuring cup. Whisk well to blend. Season the tuna steaks with salt and pepper on both sides. Place the sesame seeds in a pie plate or shallow dish and, working with one piece of fish at a time, press the tuna into the seeds to adhere to all sides. Heat the grape seed oil in a non-stick pan over high heat. Once the pan is hot, add the portions of tuna to the pan. Cook for 45-60 seconds on one side, flip and do the same on the second side. Use tongs to stand the pieces up and sear the sides for about 30 seconds. Remove to a cutting board and slice thinly. In a large bowl, combine the greens with a few tablespoons of the vinaigrette and toss until evenly coated. Taste and add more dressing if desired. 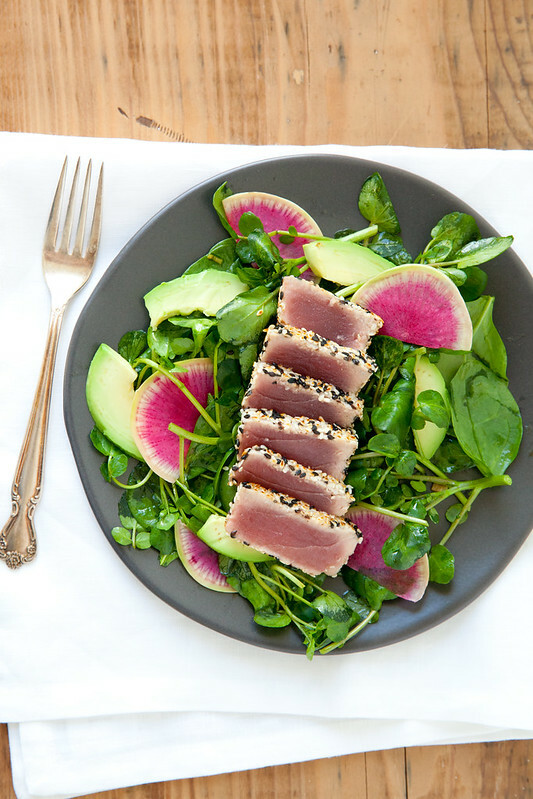 Portion the greens out onto serving plates and top with the sliced avocado and radish. 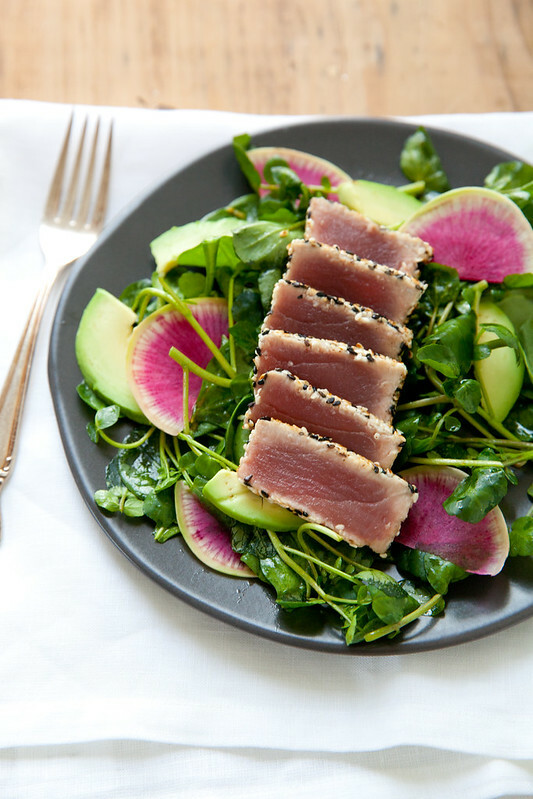 Lay each portion of sliced tuna on top of the bed of greens and serve immediately. Bibb lettuce would be another excellent option for part of the greens, though it isn’t currently in season. If you can’t find watermelon radish, consider topping with thinly shaved red bell pepper and grated carrot in its place to add additional pops of color and texture.